Welcome to the first fight in my tournament! Each pack member has the advantages listed. Blue led her pack through the forest. She picked up the scents of four Raptors, telling her packmate. The other pack appeared and snarled. The Raptor Squad charged at their foes. Charlie, the youngest Raptor, got bitten by one of the Tiger Raptors. He slammed her into a rock and clawed at her. But Charlie kicked him away, her toe claw smashing into his belly. He roared and slashed her face, taking her eye out. Blue spotted this and ordered Delta to check on Charlie. The male Raptor bit Charlie's face, but Delta bit him and tackled him to the ground. Charlie came in and stuck her sickle claw into his throat, killing him. Meanwhile, things weren't going well for Echo and Blue. The alpha Raptor had attacked Blue, pinning her down. Echo tried to save her but was attacked by the alpha's mate. Delta charged and bit her, then Echo got up and fought the alpha himself. The wounded Charlie attacked the alpha, but another Raptor jumped on her. He cut Charlie's belly open, killing the young Raptor. Blue roared and attacked him, biting his leg. He fell and Delta bit his upper jaw, with Blue tugging on his lower jaw. But Echo's body dropped near them, the opposing alpha standing over her. Now there were only two Raptors from each pack left. Delta attacked the alpha's mate, vowing to avenge her sisters. But her foe's mate, the alpha, attacked her and killed . Blue watched this in horror and attacked the alpha's mate. She ripped her enemy's lower jaw off. The last Raptor from each pack attacked, clawing and biting each other. Blue emerged victorious and killed her foe by blinding him and ripping him apart. She looked at her dead pack, but they stood up, except Charlie. They were just unconscious instead of dead. The pack of three left, in search of a meal. The next tournament fight will be Rexy Vs. the Buck T. rex. Awesome fight, but the Tiger Raptors are the male verisons of the first nublar raptors. If you look closely in The Lost World you can see a classic Jurassic Park original Raptor in with the Tiger Raptors. I thought the Tiger Raptors were the male version of the Nublsr Raptors as well. However, if we're comparing both "packs" I'd have to put my money on Owen's Raptor Squad - simply because they seemed more intelligent. They would likely coordinate better. The only factor I don't see listed that could be a major wild card is the number of Raptors in each pack. How many were there in The Lost World? I thought surely more than 4. In which case they may win over the Raptor Squad. Yes, the "tiger raptors" are the male Nublar individuals. @Xenotaris, I noticed that too! SHE was the one who jumped on the roof when pursuing Sarah! And then she fell off and fought her brother. @TheGamingT.rex, listen up. Your next fight is going to be a doozy, consisting of two ICONIC and POWERFUL creatures. I am worried about those two fighting, because I love them both and would prefer neither of them to get hurt in a fan-fight against each other, but I'm not writing it...you are. So write a fight they both DESERVE! Go over previous fan-fights on this forum to get an idea on how well written this has to be. Learn about each T.rex's traits as if they were your own. Make the fight realistic, with logic and flow. And surprise us! It doesn't have to end in the death of one of them. It can end in a surprising twist, so think very deeply about that. Ultimately, give it some SUSPENSE, like how the JP movies did (for the most part). Good luck on this. @AlphaDino65: the buck is the juvenile rex from JP3. The TLW rex is the bull. @Chris Picard: I decided to go with 4 in the Tiger Raptor pack to make it an even match. Nice fight. Was rooting for the Raptor Squad. Rexy vs the buck, that'll be an interesting battle. Still follow AlphaDino's advice though. The buck may not be as powerful as the bull, but he's still a powerful creature. Don't hesitate to add some detail. Give us a feel for the battleground. Switch from one competitor to the other before they actually meet. When you're writing, put in paragraphs to make it easier to read. What I do for a paragraph is one sequence per paragraph. Say two are shoving each other, there's one paragraph. Describe the sequence. Small details help. Small details are the difference between visualizing the battle as the original 8 bit Super Mario game and something newer like Super Mario Galaxy. Just some advice for the writing itself. I enjoyed reading the battle still, don't worry about that. Yes, yes that would. Rexy in her prime in the battle? How old is the buck? Just wondering. Don't hesitate to get in depth with the description of the competitors. If you don't mind, take a look at this fight. Ignore the little blurb at the beginning. If you're curious though, PM me. The buck is a 37 ft juvenile which means he's close to fully grown. And yes Rexy is in her prime, check my post announcing the tournament. Just checked it and alright. Looking forward to all those fights. Haha, fair enough. I'd say leave Rex vs Spino alone until you're extremely confident in your writing. You'll hit that point of you keep writing, but you're not there yet. THE GAMING T.REX - Oh, wow! That was a fantastically designed battle! I greatly enjoyed the way in which you have presented the more feral aspects of the animals! Superb work ! I am very much looking forward to seeing what you will present in your next conflict! Thank you so very much for taking the time to create this and share it with us! @The Gaming T. rex. I thought Buck was the adult Tyrannosaurus from The Lost World and Junior was the name of the Baby Tyrannosaurus and I personally doubt that JPIII's sub-adult T. rex which I will dub "Mr. Green" is Junior since Junior had a dark green coloration like his farther nor did it had any indication that it once had an injuried leg and the whole Word of God explaition that Mr. Green is Junior was pretty much shoehorned. 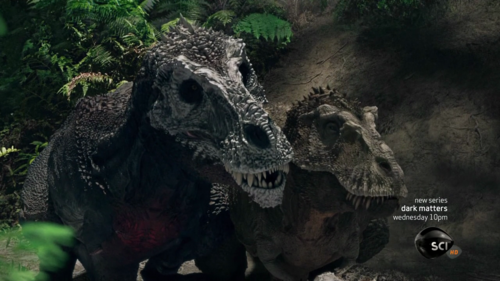 Beside realistically Idominus rex will easily crush Spinosaurus because simply Indominus rex is part T. rex. The Only reason why Rexy couldn't instant kill Indominus was because she was part Rugops who is pretty much an armored theropod. Buck is the father to Junior. Mr. Green is the Subadult. I would rather see Rexy vs Spinosaurus, which we all know Rexy will turn little Spino into cat food. Not to mention how Tyrannosauruses are smarter and more powerful than any spinosaurid, on land at least. Water is a different story but thats Spinosaur's element. @Xenotaris: everyone calls the male rex from TLW the Bull T. rex because that was the name of the TLW T. rex toy. Also it's the JP3 Spino vs the I. rex. @Something Real: Thank you! The fights are goingto get more interesting as the tournament progresses. @TheGamingT.rex, the buck is movie canon. Better to go by that rather than any toy canon, because they don't always stay true with the movies. As well, the advice goes for the JP3 Spino vs I.rex battle of yours. It would be even GREATER than your T.rex one. @The Gaming T. rex. I was talking about both the JP3 Spinosaur and the real/original/pure Spinosaurus. Against Tyrannosaurus without author bias will always fail against T. rex. The Toyline is not really canonical to the movies since Roland in the movie proper calls the "bull" Buck. @Lord Vader: I'm not going to write a T. rex Vs. Spino fight because they're my two favorite dinosaurs and because in the comments, fans will argue about which is better. Fair enough my friend. That's a good reason to not. Nice! I was hoping the JW raptors would win too. The TLW raptors are much more experienced though, since they dealt with many more attacks and kills. But yes, the Jw raptors are smarter. Also, can you make another fight with the JP3 raptors?